We are happy to begin partnering with some amazing brands! From gorgeous, bright nail colors, to awesome lipsticks and blushes, Julep has some amazing products that can be delivered right to your doorstep. Yes! One click! And when you shop Julep, you can find some great savings on products you already love and buy. Click the link below to shop Julep. 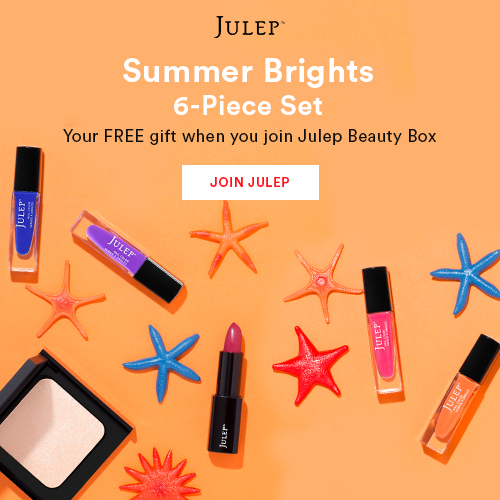 Use the code HEYSUMMER and get your free Summer Brights 6-piece gift when you join Julep Beauty Box. Features four vibrant nail colors, a bold lipstick, and a luminous highlighting powder – everything you need to brighten things up for summer. A $106 value.